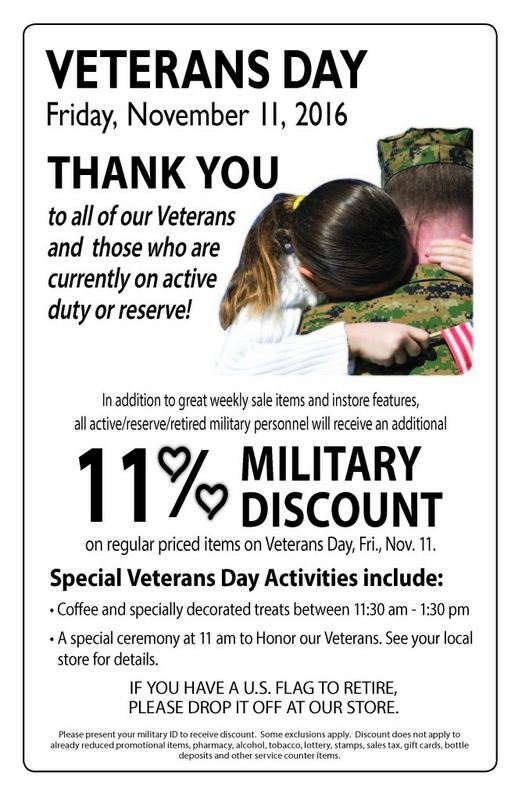 Grand Rapids, Mich. – SpartanNash will honor veterans and active duty service members this Veterans Day by offering an 11 percent discount on all eligible products in its 159 corporate-owned retail stores in 10 states. As the leading distributor of grocery products to military commissaries in the United States, SpartanNash will also hold special tribute ceremonies at each of its facilities at 11 a.m., in addition to making a $5,000 donation to The Mission Continues in honor of its more than 700 associates who served or continue to serve. The Mission Continues empowers veterans who are adjusting to life at home to find purpose through community impact. The nonprofit organization deploys veterans on new missions in their communities, so that their actions will inspire future generations to serve. Each of SpartanNash’s 17 distribution centers will also hold flag-raising ceremonies and observe a moment of silence for all those who have lost their lives defending our freedoms. Companywide, all SpartanNash locations will also display posters recognizing and thanking associates who are veterans. SpartanNash has more than 700 veterans, Guardsmen and Reservists that work for the company. Of the more than 1,200 associates who work for MDV, the company’s military division, 215 are veterans – accounting for 17 percent of its workforce. Because of its commitment to hiring, training and retaining veteran associates, SpartanNash was recently named a bronze-level Veteran-Friendly Employer by the Michigan Veterans Affairs Agency. On Veterans Day 2015, SpartanNash began collecting old, worn, frayed and/or faded American flags at each of its retail grocery stores, distribution centers and service centers. Each location then partners with a local veterans service organization to ensure the proper retirement of the flags. In the past year, more than 1,500 flags have been retired through the SpartanNash program.